And much more... 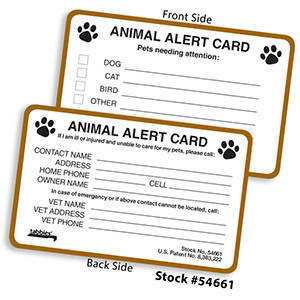 Fill in pertinent information that can then be stored in a wallet in case of emergency or for quick reference. 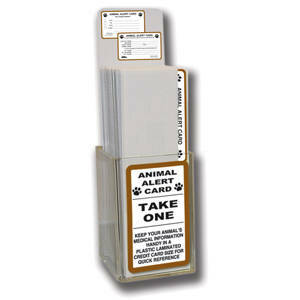 Unlike other emergency cards, the Animal Alert Card is self-laminating to seal in written information and eliminate smudging. Folded together, the card is strong, durable and water-resistant. There is nothing else like it on the market. 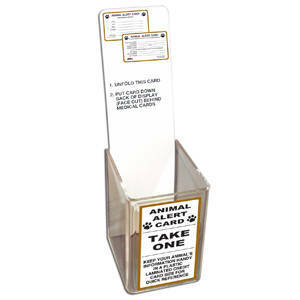 Counter display with placard header can be used in the office, lunchroom or wherever it is convenient for clients, employees or staff to take for themselves or to give away.